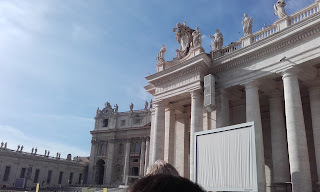 For the second day of my visit I had to do the good Catholic thing of making a pilgrimage to the Vatican City. I was looking forward to seeing the pictures from my Leaving Cert History of Art book come to life. Additionally the concept of a city within a city like a Russian doll fascinated me. Being from Limerick this was nothing new as historically the city comprised of three distinct towns. When I booked my flights I was unaware of how the Epiphany was still such an important Holy day. I am deficient the necessary patience to deal with long queues. Luckily for me it appears that everybody paid a visit to Pope Francis' gaff the previous day so I only had to wait about ten minutes. This involved airport-like security (I suppose we were entering a new country after all) walking through a metal detector and bag x-rayed. 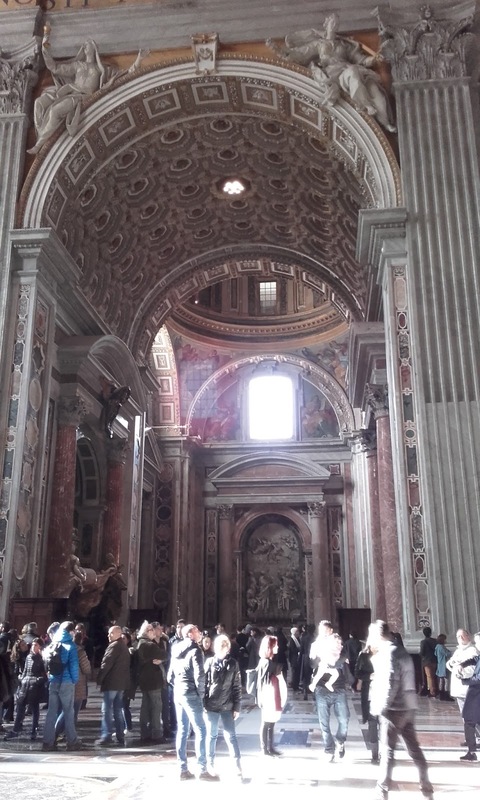 St Peter's Basilica was designed principally by Bramante, Michelangelo and Bernini. It is one of the largest churches in the world and regarded as one of the holiest Catholic shrines. The area now covered by the Vatican City had been a burial ground for the numerous executions in the Circus of Nero. 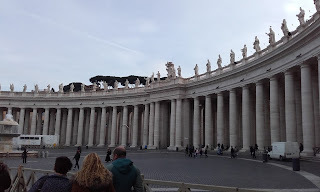 On first entering you are faced with Bernini's impressive colonnade four columns deep frame the trapazoidal entrance to the Basilica. This is St Peter's Square on a quiet day. It is a shame that the fencing is there (as seen in photo) as it gave the area a theme-park feel. Nothing prepares you for the richness or the ornate interiors. Everything is vying to attract your eyes. The visitor feels completely dwarfed by the scale of everything in the building. 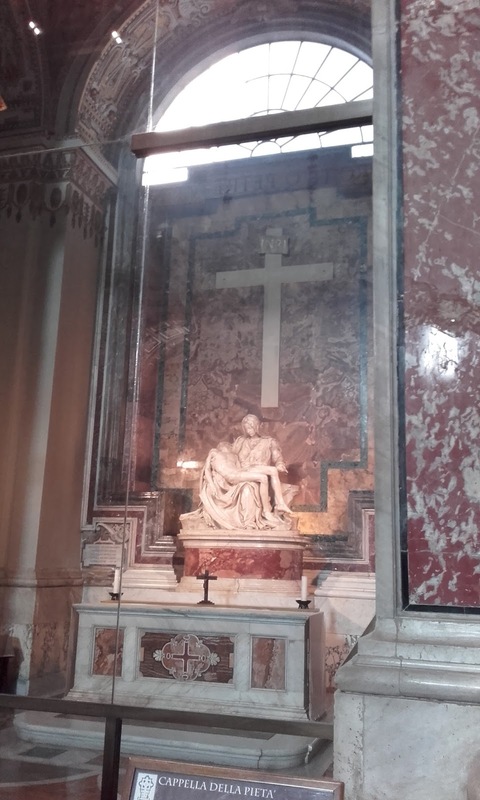 This church was designed first by Michelangelo with Maderno's naves added later. 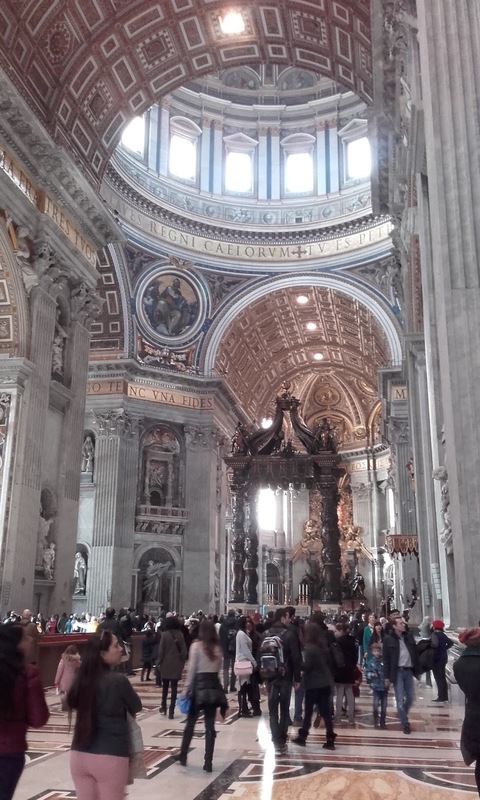 The wonderful Baldacchino (pavilion-like structure beneath the dome) was designed by Bernini. At 30 metres tall it is claimed to be the largest piece of bronze in the world. It is always very strange seeing a famous work of art in the flesh. Michelangelo's Pieta is smaller than I had imagined but nevertheless the maternal love and heartbreak of a mother holding the dead body of her only child cannot fail to move you. 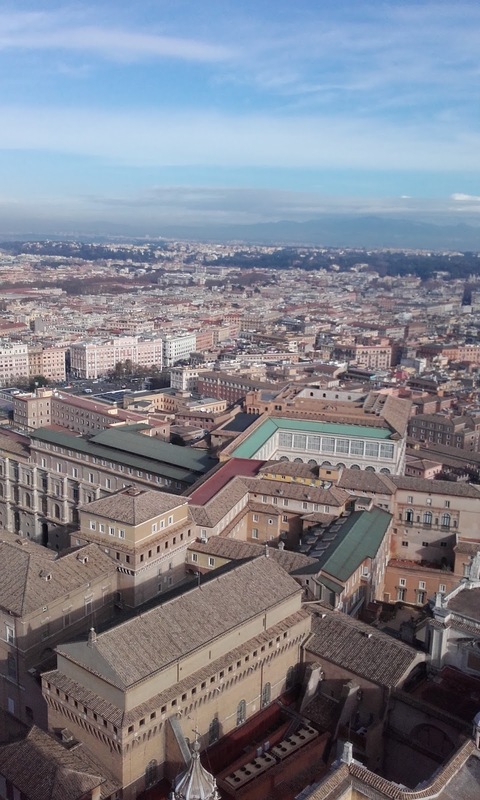 After taking in the beauty of the ground floor it was now time to move up towards the heavens and make the climb to the cupola of the Basilica. Michelangelo had redesigned Bramante's dome in 1547.The dome rises to a total height of 136.57 metres from the floor of the Basilica to the top of the external cross. It is the tallest dome in the world. Being cocky Irish people we of course got tickets to go 'a piedi.' The lift was for the old and infirm. Tickets were €6 per adult. Still inside the building I started to see what type of height we were dealing with. All the people below were so small as you can see in the photo to the left with the protective grating. Boy was that climb tough! To keep us motivated every now and so often I would say "we have just earned two scoops of ice-cream", "we have just earned four scoops of ice-cream." It was a bucket I think by the end of it. You would not want to be a person carrying a lot of weight to be able to be able to fit through the monastic-like spiral staircases towards the top. 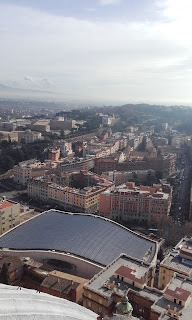 The ascent was well worth it once we got to the top and visually took in the city. Every building unified in this exquisite architectural sea. My eye of course was drawn immediately to the Aula Nervi as it became known. Enigeer Pier Luigi Nervi's Paolo VI Audience Hall was commissioned by Pope Paul VI in 1963 and it was inaugurated in 1971 (see image below left). A family affair this reinforced concrete building was realised with the assistance of his architect son Vittorio Verdi. The auditorium can accommodate up 12,000 people covered by a double curving parabolic vault. 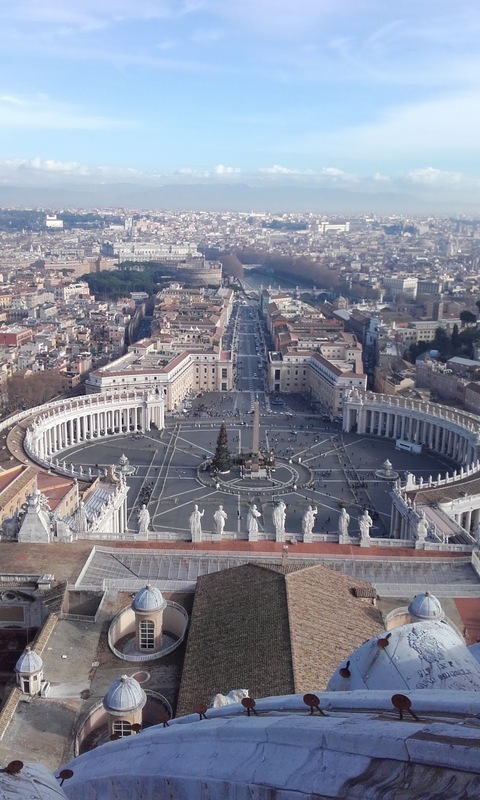 Next to grab my eyes of course was the magnificent St Peter's Square with the Vatican Obelisk at its centre. Standing at 25.5m tall, made of red granite this obelisk was removed from Egypt by August to the Julian Forum of Alenxandria where it stoof until 37 AD when Caligula ordered the fourm demolished and the obelisk transferred to Rome. It was moved to its current site in 1586. 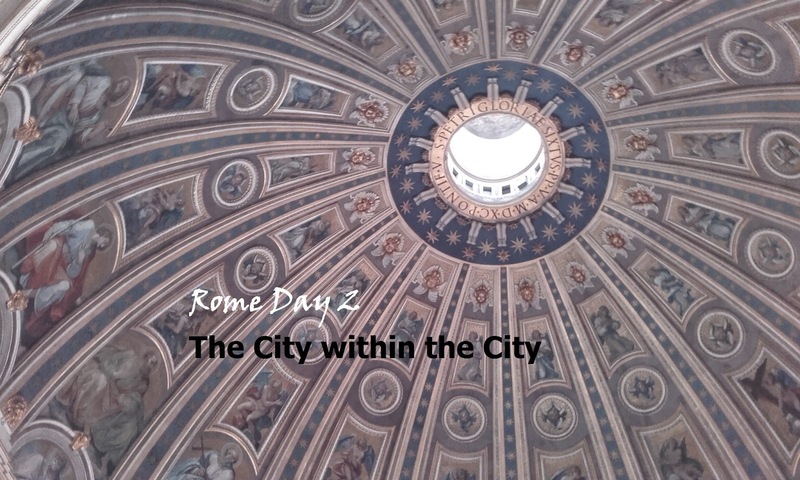 As Rome was the centre of the Roman Empire the Papal City was the city of the powerful Roman Catholic empire. The square is approached by the Via della Conciliazione which is linking the Vatican City and the centre of Rome. It lends the Basilica extra grandeur similar in Ireland to the main street of the estate villages in the lead up to the entrance to the landlords demesne. This road was constructed between 1936 and 1950 but plans were drawn up several times over the centuries. 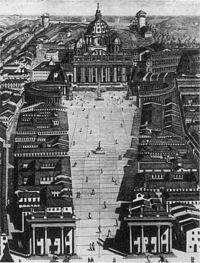 One such plan was Alberti's 'open' plan in 1776 consisting of a single V-shaped boulevard. 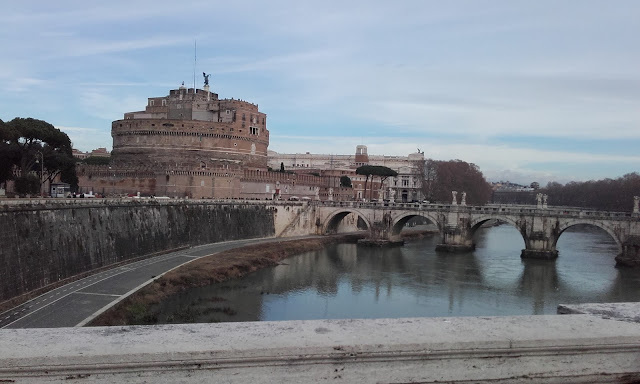 Widely opposed instead for a 'closed' plan maintaining the 'spina' or spine of the structures between the square and the river Tiber. 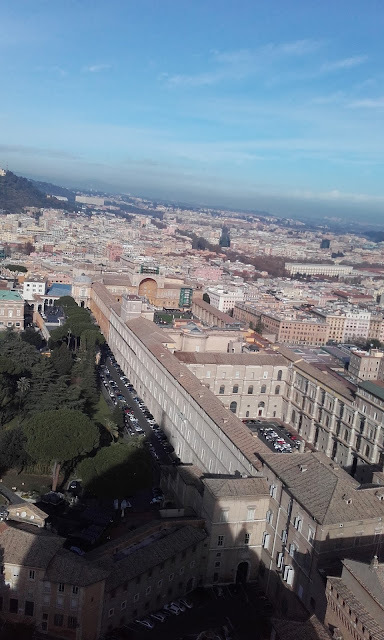 Mussolini resurrected the idea of a grand thoroughfare symbolically connecting the Vatican to the heart of the Italian capital. To fulfil this vision he turned to the fascist architects Marcello Piacentini and Attilio Spaccarelli. The controversial demolition began in October 1936 with many residents displaced en masse to settlements outside of the city. 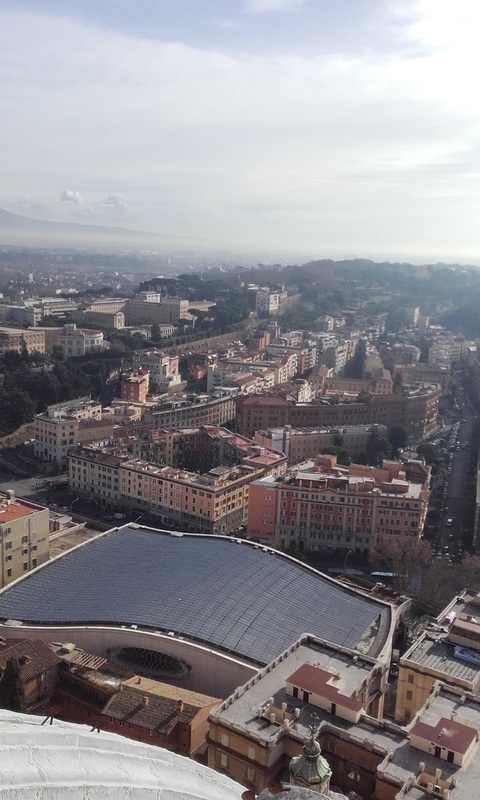 Mussolini would create his own version of the square with the obelisk in the EUR district which I visited a few days later (future post). My breath was taken away with the view, the use of my legs from the hundreds of steps so it was the lift on the way down for us. I'll finish Day 2 in my next post with the Patheon and a fit out by David Chipperfield Architects, Of course the day was completed with lots of gelato!